Pakistani forces have captured the strategically important town of Ladha from the Taliban in ongoing clashes in South Waziristan, officials say. According to the military, 28 militants and five soldiers have been killed in battles over the past 24 hours. 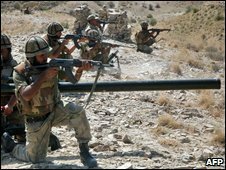 The army went on the offensive in South Waziristan on 17 October to root out militants behind a wave of bombings. The latest fighting took place as gunmen wounded an army brigadier in a drive-by shooting in Islamabad. There has been no independent verification of the military's latest reported gains as journalists are not allowed into the area except on occasional trips organised by the military. The BBC's Syed Shoaib Hasan in Islamabad says that the military does seem to have made significant gains in its campaign in South Waziristan so far - and across the country there seems to be a consensus that the operation is the right option at the moment. 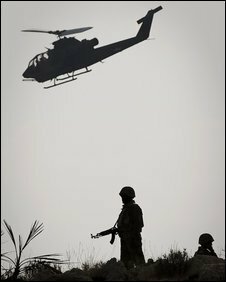 Our correspondent says that the military's confidence is not without basis - despite a wave of militant attacks that has killed hundreds in recent weeks, most Pakistanis remain firmly behind the operation in South Waziristan. The military says that it has advanced into the militant heartland from three directions and in addition to taking Ladha has also captured the militant-held village of Makeen. It says that heavy clashes in Makeen and Sararogha have claimed lives on both sides. "The forces have secured towns of Kaniguram and Saam," a local administration official told the BBC. "Tanks, backed by ground troops, are now advancing into Ladha sub-division." The official added that Kaniguram had been completely secured and troops were now clearing mines in the surrounding area. Ladha, located between Kaniguram and the northernmost town of Makeen, is the largest sub-division of South Waziristan in terms of population. It is a highly mountainous region, where the Taliban have dozens of hideouts. There is a huge fort there which was manned by Pakistani paramilitary troops until recently. It was abandoned after the Taliban blocked all routes to it, making it impossible to bring in supplies. The latest fighting is taking place in the same area where Pakistani Taliban chief Baitullah Mehsud was killed in an attack by a US drone aircraft in early August. "Troops are also arriving from the northern boundary of the territory and have reached Makeen's main market," the official said. "Security forces have also set up fortified bunkers in the mountain ranges around Makeen. "The most heavily mined area is that between Razmak and Makeen and troops are also clearing that territory." Razmak and Makeen, in the north of South Waziristan, were the only major towns not in the control of the security forces. Officials say that most of the Mehsud heartland in South Waziristan is now under their control. Only a few areas are controlled by the militants, and these are being regularly bombarded by jets, helicopter gunships and artillery. But as the operation against the Taliban militants in South Waziristan enters its fourth week, officials say that many militants have escaped the military's onslaught. 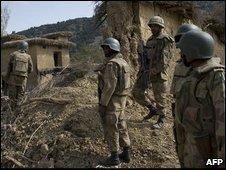 They say the militants have taken refuge in the nearby tribal regions of North Waziristan, Kurrum and Khyber. "We have not seen much resistance as we entered Makeen," a senior military official in the region, who declined to be identified, told the Reuters news agency. "Our troops are now clearing mines and improvised explosive devices (IEDs) and moving forward." The clashes are being closely watched by the US and its Nato allies fighting in neighbouring Afghanistan, who argue that the South Waziristan area is a sanctuary for al-Qaeda and Taliban fighters. In a separate development, police say that they have killed two militants in a clash after they refused to stop their vehicle at a checkpoint in the town of Mansehra, 90km (56 miles) north of Islamabad. Two policemen were wounded in the attack, police say, and bomb-laden jackets and detonators normally used by suicide bombers were recovered.